Local 5277, established under the Canadian Union of Public Employees, is comprised of workers and activists who have come together to create quality, union-developed community and member-targeted awareness/engagement campaigns for labour unions. Our members consist of designers, animators, IT specialists, programmers, cinematographers, photographers, editors, creative writers, event specialists and more. We operate as a resource for unions to complement the current communications work being done by local and national union staff. Our members provide innovative alternatives to classic communication methods in an effort to modernize the way unions communicate with their members and the community. CUPE Local 5277 helps fellow unions develop strong local identities through the creation of customized logos and general branding; streamline member engagement through custom website creation, app development, robocalls and e-blasts; garner public awareness through media buy campaigns and press releases; generate online conversation and interaction through social media campaigns and regular updates; encourage member participation through local event planning, management and documentation; and update/inform members through union-printed flyers, postcards, booklets and calendars. With a fully-equipped unionized print shop, we have the unique ability within CUPE to provide our clients with the materials they need quickly, while guaranteeing print products that are developed and printed by CUPE-unionized staff. As young, proud members of CUPE, we take pride in the work we do for our fellow brothers and sisters and are excited to be able to assist in the creation of campaigns that have the potential to greatly affect the lives of hard-working Canadians. In October 2013, Union Marketing employees made the decision to organize. In this unique situation, the employees’ decision to organize was supported by the employer. Employees were looking to establish a collective voice, while management wished to support the work of its clients. CUPE Local 5277 ratified its first collective agreement for a one-year term in December 2014; the agreement included an 8.5% wage increase along with a variety of other innovative clauses, such as the potential for a student debt retirement plan that transforms into a pension plan. This plan is currently in development by the local. 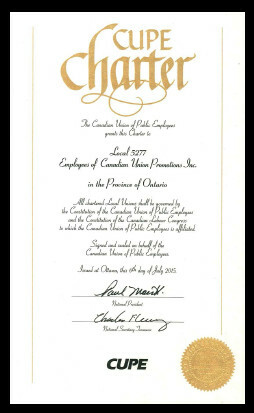 In August 2015, CUPE presented our local with its first official charter, naming us CUPE Local 5277. 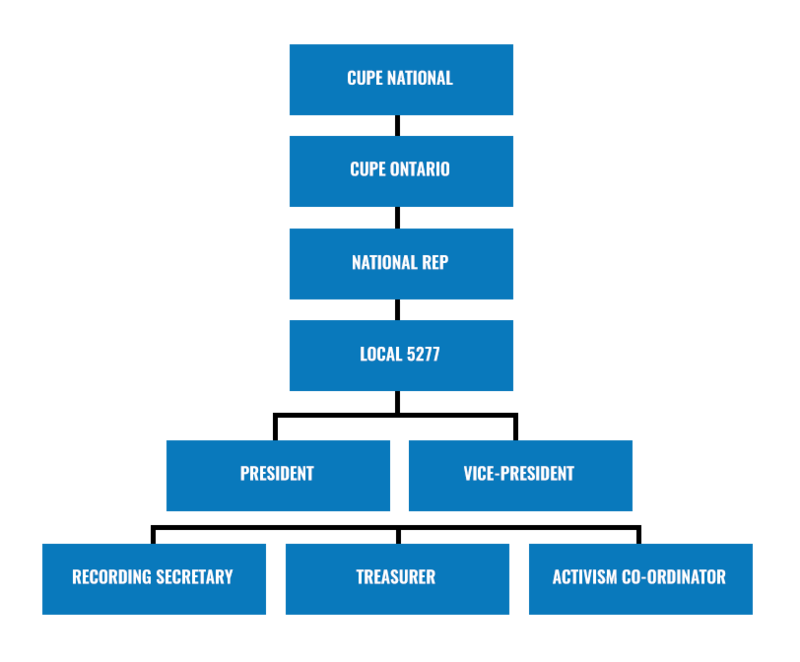 Elections were held shortly after – conducted according to guidelines in the CUPE Constitution – and the first official executive was formed. In January 2016, negotiations began for CUPE Local 5277’s second collective agreement. The agreement was ratified by 100% of the membership in June 2016. Highlights included an 8.5% wage increase over a 3-year term, 100% employer-paid benefit premiums, a Long Term Disability (LTD) benefit plan with 100% employer-paid premiums and additional days for bereavement leave. The new agreement will expire December 31st, 2018.